Preface to the Special Issue: What' s at the Bottom Of and Beyond Expansion? In this feature, we take note of graduate schools to catch the wind of today's architectural education. In part 1, on recognition, we take a look at the environment that architectural education is in by using editorial board data and a contribution by Takashige Ishikawa from the AIJ Committee on Architectural Education. 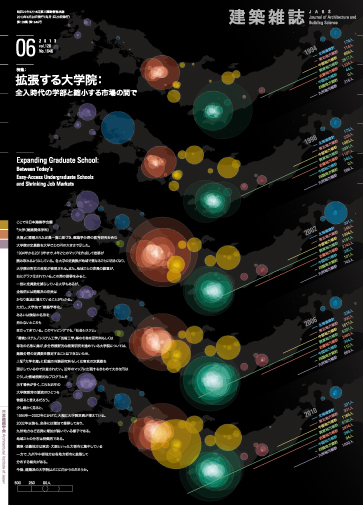 As you know, it's said that an era of easy access to undergraduate schools came in the last few years in Japan. Plus, the students sent to undergraduate schools belong to a so-called generation of pressure-free education. Many undergraduate school teachers complain that the students' achievement and eagerness to study have been decreasing. Yet there are movements such as MEXT's guidance reinforcement, the taking of JABEE accreditation, stricter judgment of requirements for qualification for examinations of registered architects, and so on. In these conditions, we can say that undergraduate education is tending to stabilize a leveled framework and is exercising less freedom in designing original educational content, can't we? On the other hand, Japan's social economic system is facing a time of sudden change in the global economic environment, and the students' job-finding is becoming diversified and borderless, both in terms of quantity and quality. And although undergraduate school was first considered a place for producing, to various degrees and extents, the intelligence for drawing ideal social reorganization, it has now reached a point where it's about to lose flexibility and even core strength, quite like a bureaucracy. But graduate school still has mobile productivity. The quick two-year cycle for a master's course is convenient for metabolizing programs, and above all students have already finished four years of basic education. Sandwiched between (1) leveled undergraduate schools facing an easy-access era and (2) shrinking and suddenly changing markets, graduate school education seems to be radicalizing, connecting to various outsides, and expanding as a whole, doesn't it? This all could be an experimental group bound to the emerging new undergraduate school image and possibly influencing undergraduate education sooner or later. In part 2, "Practice - Radicalizing Graduate School Education," six talks contrastively introduce twelve different practical cases of graduate school education born in the past ten years. Thus, we have Koh Kitayama and Yoshiharu Tsukamoto on studio style and laboratory style in architectural design education, Akiko Okabe and Masataka Baba on social systems and field work, Osamu Ukai and Takahiro Hisa on community participation in town development, Mitsuhiro Kanada and Akira Mita on the design and high technology of structural engineering, Takaharu Kawase and Yuichiro Kodama on passive design and equipment engineering, and Masami Kobayashi and Satoru Yamashiro on educational internationalization and urban-design workshops. Now, after much consideration, it seems that these movements also already had some antecedents in various thinking and practices that came in response to sudden changes in the social economy in the 1960s and 1970s or that erupted as a value axis counter to the Establishment. Graduate students in those days jumped out to raw cities, communities, and overseas because doing so was also criticism of Japan's "ivory-tower" universities; whereas nowadays it is undergraduate schools that desperately try to take in the outside. In part 3, "Historical References - Expansion and Change in the 1960s and 1970s," we intend to somewhat historically relativize current conditions. Thus, we asked Yasumitsu Matsunaga about urban-design studios in the USA, Makoto Motokura about design survey, Umihiko Cho about the Takayama Architecture Seminar School as a private school, and Toshio Ojima about formation details in the field of environmental engineering. For part 4, "Verification from Outside - What Is Required of Graduate School?" we get frank opinions from every social field that accepts the youth who studied architecture in undergraduate and graduate schools. Sixteen people provide comments: Wang Fangji, Naoteru Umesaki, Yoshiharu Kanabeko, Yasushi Kitamura, Takahito Suzuki, Kiyoshi Tanabe, Makoto Tanijiri, Tsuyoshi Tane, Takaki Nakayama, Takaya Nanahoshi, Kazuhiko Nishi, Jun Hashimoto, Kazuyoshi Fujisawa, Atsushi Yamada, Tomohiko Yamanashi, and Kazuhiko Yamamoto. This feature sketches sections of expanding architectural education. At the bottom of or beyond these, what sort of ideas, more than adaptation to the times, might you construct? If the feature proves an opportunity for such a question, we'll be happy. This issue has been edited by Kyoko Ikuta (Meijo University), Nobutaka Kashimoto (Nikken Sekkei), Fumihiko Sunamoto (Hiroshima International University), Kazuo Tamura (Chiba Institute of Technology), and Hironori Watanabe (Tohoku Institute of Technology). 008 [Preface to the Special Issue] What's at the Bottom of and Beyond Expansion? Part4 Verification from Outside─What Is Required of Graduate School? 050 [Reviews of Previous Issue] 2013, April｜Energy Conservation Obligatory in 2020: Implications for Architecture Then?